The seemingly simple question of how often a roof should be replaced has a complex answer. According to the National Roofing Contractors Association, a roof should be inspected twice a year: once in the spring and once in the fall. If you’re seeing any of these signs, it’s likely that your roof does indeed need to be replaced. At times like these, it also helps to have a firm grasp of the expected lifespan of your roofing materials. Information on residential and commercial roofing material life expectancies can be found in the previous chapters. You can also consult your roofing contractor or manufacturer directly for further detail. The type of roofing material used will determine how often a roof needs to be replaced. For example, the average lifespan of a cedar roof is roughly 20 years. However, in drier climates, a cedar roof is likely to need more frequent repair and replacement since it is prone to splitting. A properly cared for tile roof can last up to 100 years, although individual tiles are likely to break. A concrete roof is highly durable and should not need replacing throughout its lifespan. When determining how long your roof will last, there are several important factors to keep in mind. Just because you have a leak in your roof or are missing shingles doesn’t mean you need to pay for a roof replacement. In many cases, these surface issues are easy to repair without the need for new roof installation. Secondly, a number of new homes and businesses are built carelessly with serious oversights. Building mistakes can be the cause of long-term frustration, no matter how old your roof may be. For instance, if a vent has been left unsealed or if a chimney has been caulked improperly, it could lead to leaks with the potential for internal structural damage. If you find errors in the construction of your roof, try to contact the original builder, if possible. If the original contractor is unavailable, you may be forced to pay for expensive roof repairs or a complete replacement that may not be covered by your original home warranty. 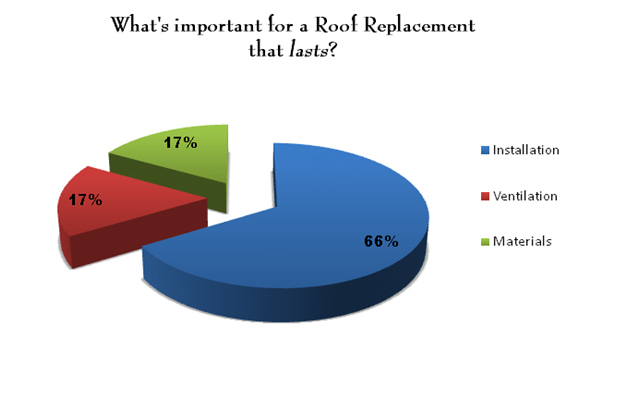 Based on statistics from the RSI Group, proper workmanship is the most important component in ensuring that a roof will last throughout its lifespan at 66%.8 While both ventilation and material selection come into play at 17% each, installation remains paramount to cut down on extraneous costs needed to replace a roof before it is time.